Bitcoin is exactly the kind of fantastic real life science fiction kind of project that I enjoy: a peer to peer, anonymous, cryptographically secure currency. I’m not even an armchair economist, but I suspect the hardest part of starting any new economy is the chicken and the egg problem. Sellers won’t join the market unless there are potential buyers, and buyers won’t join unless there are people selling things they want to buy. Unfortunately in the case of Bitcoin, both the chicken and the egg have been eaten by the monster called currency speculation. It is likely that the majority of actual transactions are between speculators and exchanges, taking advantage of volatility to make a profit in BTC or USD. Half a paragraph later, I’m still not an economist, but I also suspect that as a larger fraction of the economy goes to goods and services, the currency will stabilize, encouraging more people to use it. Therefore, I am doing my part in bootstrapping the Bitcoin economy by using a project that loves to bootstrap. 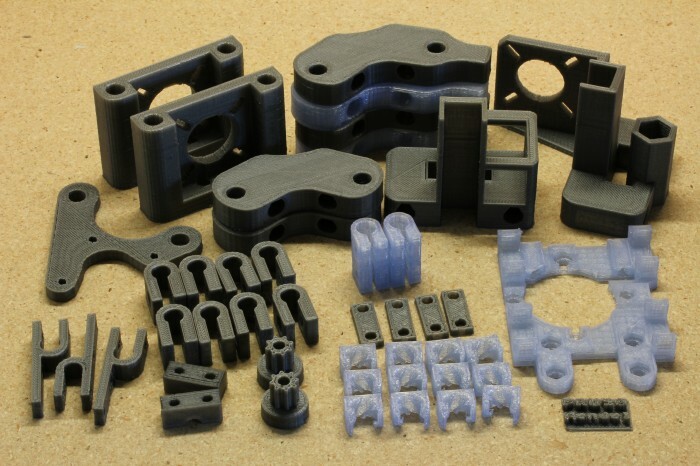 I’m selling a set of SAE Prusa Mendel parts printed on the Mendel used in many of my recent projects. 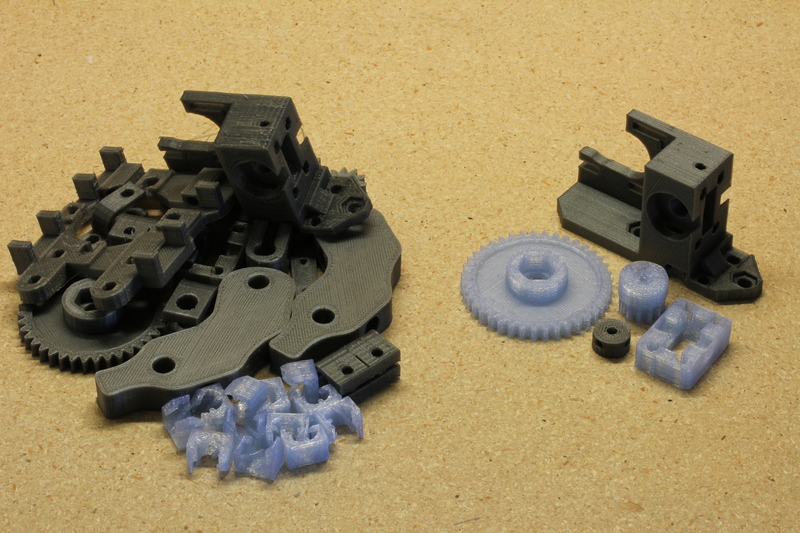 The parts are from the current files in the PrusaMendel git repository, and are printed in PLA. They are quite clean and strong, but may need a little work with a knife or drill bit. The Wade’s Extruder and PLA bushings from the repository are also included. But wait, there’s more! Between getting misaligned on the trip home from Maker Faire and a torn belt, my printer was in fairly rough shape for a few weeks. While repairing it, I printed RepRap parts to test the calibration. I’m including the usable parts printed during that time and some more good spare parts I printed recently; this is the pile on the left in the bottom picture. The full set of good parts from the top picture and the Wade’s Extruder are in separate bags. I’m selling this set for the hopefully reasonable price of 5 BTC, shipped USPS Priority Mail to anywhere in the US. At the exchange rate at this moment, that is roughly $72.50. It could be $20 or $200 by tomorrow for all I know, but I’m willing to take the risk if you are. Email me, and we can arrange the transaction. Sold! There was less interest than I was hoping for, so I probably won’t be doing it again. actually, if the code principle of the cryptographics in Bitcoin are interesting, the economical model is deeply flawed, and will lead to a bizare end, with first entrants having much of the purchasing power, and last will end up with bitcoin valuated at millions of (€/$/…) as the emission of bitcoin is toping it maximum. there is other p2p currecy models around, I suggest you to look into Open-UDC f. ex. Those 5 BTC ARE a lot more than $72.50 now! Yep! They have also been quite a lot less than $72.50 in the time since I sold the parts. Bitcoin is a roller coaster. Those 5 BTC ARE **a lot** more than $72.50 now!